Hi. I'll admit that I haven't really been keeping up with the ins and outs of the new Cincinnati Streetcar project. Also, I was recently talking to a friend who also didn't know about the ins and outs of the Streetcar project. However, I did tell my friend that I heard that the new streetcar was only suppose to run from Over The Rhine to Clifton. But then my friend and I start talking about whether or not this new streetcar project was going to help alleviate the mounting rush hour traffic on our expressways(which I think is becoming more and more ridiculous as the years go by). Well, neither of us knew, although thinking that the streetcar was only going to run from OTR to Clifton, our guess would be No! But anyway, I told my friend that I would do some research on the subject...and from one Fox19 video/story, I found out that the new streetcar was only going to be 4 miles long. Had the street car funding gone through, that would mean one quarter of all the funding for new construction in the state. would go to a 4 mile long street car route that is already served by city buses. And from that information, I figured that what I heard about the streetcar only running from OTR to Clifton must be true. However, how in the world is a streetcar project that is only going to be 4 miles long, going to benefit the entire City of Cincinnati metroplex? Also, how is this new 4 mile long streetcar project suppose to help with the mounting rush hour traffic in Cincinnati? Although, common sense makes it sounds like it was never intended for that purpose. Therefore, what is going on in this city? Is this city crazy???? Or perhaps a better question to ask is: Are the leaders of the city of Cincinnati crazy???? ......What is going on?????? Additonally, I had recently read this wcpo.com story about this $48 million transit station that sits empty underground in downtown Cincinnati. Not only is the streetcar route only a few miles long, but it covers a route no one wants to go. If you ran a bus over the same line and paid everyone who got on it a dollar, it would still be empty. What it does do is move some of Cincinnati's development to streets where the connected have investments. So, big money is behind it and they won't let go. The fact that some people willingly want to tie this city's hands behind its back and prohibit any sort of rail development here for the next decade is so ridiculous, it's sublime. Nowhere else in this country would residents shoot their own city in the foot with a long-term ban like that. But, this is Cincinnati after all. Fortunately, most of the most vocal opposition to the streetcar comes from people who live outside Cincinnati city limits, so they have no real say in the matter. So there's that. Here's hoping people realize that this city badly needs rail transportation in the coming years if it wants to continue to even think about competing for new jobs and new, young residents. Even people who are personally opposed to the streetcar itself are starting to see that banning all rail projects for the next decade is civic suicide. Hell, even the ultra-conservative Cincinnati Enquirer called the referendum to ban the streetcar a "bad, bad, bad idea," adding that "we vigorously oppose Issue 48 and urge voters to reject it." Also, Cincinnati business institutions Procter & Gamble and Macy's have both made contributions to Cincinnatians For Progress, the group fighting in support of the Cincinnati streetcar. Last edited by abr7rmj; 11-02-2011 at 05:47 PM.. The original recent plan (there've been many) was to have the line run from the riverfront through OTR, then up Vine St Hill to someplace between the UC/hospitals area and the zoo. Then the brilliant, forward-thinking Gov Kasich yanked state financial assistance. Now the proposed line will only extend north as far as the foot of the hill in the beginning. A lot of any potential success of the truncated streetcar line will depend upon the turnaround of OTR, towards which gazillions of dollars have been shoveled with only spotty success in some parts. Last I checked, the crime rate there was still sky-high. Few are those (except for tourists) who'd want to hop a trolley to/from "The Banks" as far as 8th St when the walk is easy. Folks living downtown and looking to do their food shopping at Findlay Market would be the only appreciable - and small - segment regularly using it. Not many Music Hall eventgoer types would be willing to get there other than by car. BUT...from living in Greater Boston and seeing how moribund residential/shopping districts made amazing comebacks once rapid transit was extended or rerouted through them, I wouldn't write off the feasibility of a Cincinnati trolley. Meanwhile, Cincy compromises its ambitions and will even allow for a vote on the subject. Typical! There are people who oppose public transit all over. Cleveland was the only city lucky enough to keep both heavy and light rail rapid transit lines. The rest of us have to struggle! Granted, even Cleveland used to have a lot more streetcar lines that were ripped out, as well as an actual subway system across the Cuyahoga. So even the most "transit-oriented" city in Ohio is nothing compared to what it used to be. Some folks are determined to squander our government cash on technology that became obsolete 50 years ago. Trains fit only the lifestyle of the Japanese, stagnant Euorpe and college students today where a mass of people all live in the same place, and work or study in the same place and have few outside interests so as to make a commuter train trip fit the bill. Americans have far more diverse lives than they did in 1940 and their commuting is far too varied to make a back and forth train trip work. Only where parking is not a choice do trains make sense since it is really really stupid to have an 800,000 pound vehicle going back empty with a full crew of unionized workers until the whistle blows and 1000 people can all jump on the train and go to the same destination. Our little hybrid cars sit patiently waiting for us in the company parking lot not costing a single cent all day long and leap into action when it is time to pick up the kids from practice, carry out dinner, and the dry cleaning or swing by the gym. Try that with a train. There's a reason what Mark Twain said what he said about Cincinnati, and it has nothing to do with how visionary, forward-thinking and modern it is. Denver, Atlanta, Charlotte and Seattle go one way, Cincinnati, Dayton, Youngstown and Fort Wayne go another. Wonderful. Last edited by abr7rmj; 11-02-2011 at 09:38 PM.. It's true that the streetcar won't really help alleviate highway traffic, but the streetcar is meant to be the first step into rail transportation in Cincinnati. The ultimate plan is for the streetcar to tie in with light rail at the "unused riverfront transit center." This will absolutely help reduce traffic on our highways. Imagine being able to get on a train near your home, hop off at the riverfront transit center, and take the streetcar throughout Downtown, OTR, and Clifton. Sounds pretty nice to me. I am going to vote NO on issue 48 because it is an awful idea. It would kill all rail transit in Cincinnati for 10 years, even if a private company was willing to cover all of the costs. That is the most ridiculous thing I have ever heard. Also, the people leading the opposition to the streetcar are very shady. They continuously spew their lies in an attempt to stir up hate for the streetcar. In fact, just last week a suit was filed against COAST calling them, saying that they knowingly made false accusations to influence the vote on issue 48. How did COAST respond? Chris Finney went today to the "U.S. District Court in Cincinnati to sue the State of Ohio to have Ohio's law against making false statements to affect the outcome of an election declared unconstitutional." 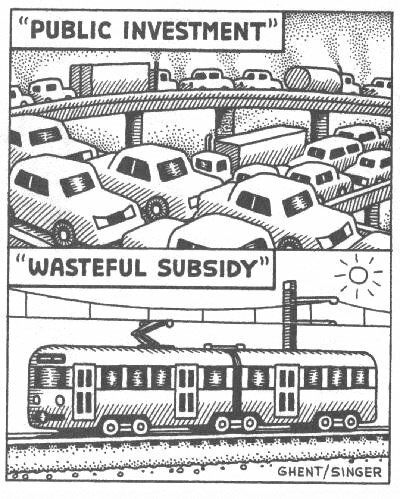 (Source is John Schneider, a leading streetcar supporter). SHADY. Disclaimer: I'm a conservative, and I see right through their garbage. So in response to the OP, no, Cincinnati is not crazy, but if issue 48 is passed, we will be.